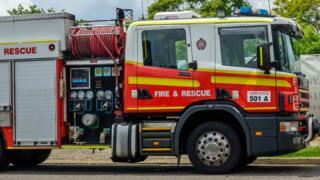 Three people have died in a house fire in Australia following reports of an explosion, police have said. Authorities found the bodies of two women and a man after flames engulfed the home in Brisbane early on Tuesday morning. Neighbours called authorities after hearing "quite a large explosion", said Queensland Police Insp Dan Bragg. He said the cause of the fire was still being determined, but police were treating it as suspicious. Neighbours had reported hearing yelling before the incident in the suburb of Everton Hills, he added. "A very thorough investigation will be conducted and we hope to get to the bottom of it quite soon," Insp Bragg said. "Screams were heard for help, but exactly where those screams were coming from… is yet to be ascertained." Fire crews put out the blaze and nearby residents were evacuated.